The Director-General of Budget Office of the Federation, Dr. 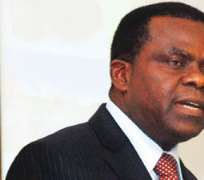 Bright Okogu, and the Accountant- General of the Federation, Mr. Jonah Otunla, said on Tuesday that Nigeria was not bankrupt but was presently in need of cash to run its affairs. Okogwu and Otunla said this when they appeared before the Senate and House of Representatives Joint Committee on Appropriation and Finance during consideration of the 2012-2014 Medium Term Expenditure Framework. The MTEF was forwarded to the National Assembly by President Goodluck Jonathan preparatory to the 2014 budget presentation in November. The committee is headed by Senator Ahmed Makarfi. Also Okogwu said though, 'the nation is currently experiencing cash flow problems from time to time; it does not suggest that it is broke. The Central Bank Deputy Governor, Mrs. Maria Alade, who represented the CBN Governor, Lamido Sanusi, at the joint sitting was, however, evasive when she was asked the same question. She said, 'Since the AGF and the DG Budget, have answered that Nigeria is not broke, that was also the position of the CBN.